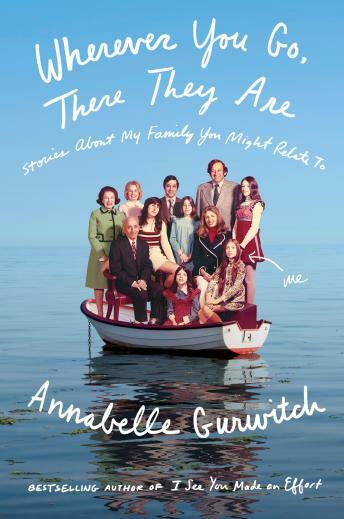 A hysterically funny and slyly insightful new collection of essays from New York Times bestselling author Annabelle Gurwitch, about her own family of scam artists and hucksters, as well as the sisterhoods, temporary tribes, communities, and cults who have become surrogates along the way. When Annabelle Gurwitch was a child, surrounded by a cast of epically dysfunctional relatives, she secretly prayed that it was all a terrible mistake. Maybe she was a long-lost daughter of Joni Mitchell or the reincarnation of an ancient Egyptian princess. A family of bootleggers, gamblers, and philanderers, the Gurwitches have always been a bit vague on the ideal of a loving and supportive family. Their definition includes people you can count on to borrow money from, hold a grudge against, or blackmail. Thus began a lifetime of Annabelle seeking out surrogates. If she’s learned anything, it’s that no matter how hard you try to escape a crazy family, you just end up in another crazy family. With a wry wit and healthy dose of irresistible self-deprecation, Gurwitch asks: Who and what makes a family in our modern society? Is it our blood relations, the people we work with, the people we pray with, our pets? Gurwitch delves into her Shalom Y'all tribe's southern Jewish roots, along with the confederacies she’s joined by accident or on purpose, and treats us to a glimpse of life with theater folk, a band of cosplaying Furries, pet people, a UFO cult, and secular humanist fellowships while exploring the fragility of sisterhood and the spec­tacularly daunting search for the community where her aging parents will spend the last chapter of their lives. By turns hilarious and deeply moving, Wherever You Go, There They Are is a must-read for anyone who’s even occasionally been frustrated by the people they share carbohydrate-laden meals with every year.